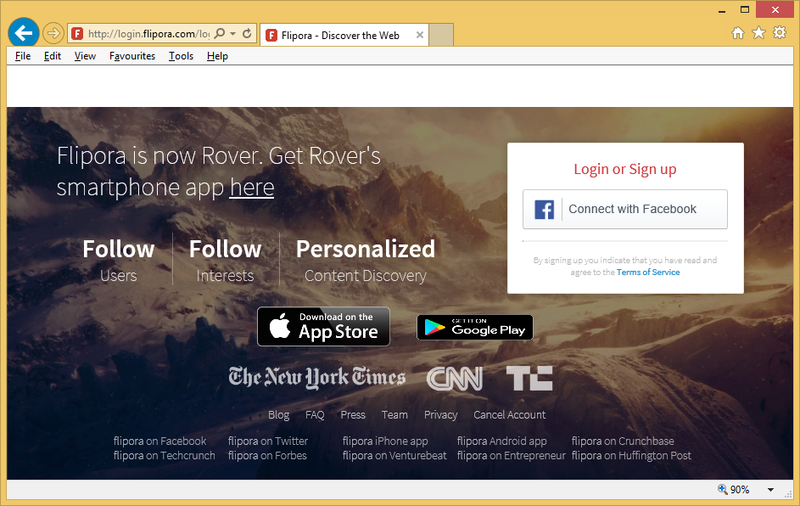 If you see Flipora.com when you launch any of your browsers, this must indicate the entrance of an annoying browser hijacker promoting this search tool. Browser hijackers are such computer infections which illegally enter computers and then change all browsers’ settings without the users’ knowledge. In the case of Flipora.com, this undesirable search tool will occupy the place of your homepage and default search tool. Judging from the appearance alone, Flipora.com is a trustworthy search tool; however, the analysis has shown that it is far from a legitimate search provider. What it is instead is an untrustworthy search tool promoting third-party pages by displaying advertisements to users. It does not display tons of advertisements on users’ screens like adware programs do; however, you will see sponsored links if you start using it as a default search tool. It is one of the main reasons the Flipora.com removal should be implemented as soon as possible. If you remove Flipora.com, ads will no longer bother you, and you will lower the chances of infecting your system with malicious software. Flipora.com might look like a legitimate search tool, but the truth is that it acts as a browser hijacker. That is, it changes all browsers’ settings and starts showing annoying advertisements. You will find these ads among normal search results, so, most probably, you will not even recognize them. These commercial advertisements are the main reason users have to go to uninstall Flipora.com from browsers as soon as possible. If you do not do anything about their presence soon, you might find malicious applications on your computer in the near future. This search tool will not start downloading malicious programs on your computer behind your back. Instead, you will be redirected to untrustworthy third-party pages if you click on advertisements displayed by it. Not all the ads will lead you to pages with infectious contents, but the chances are high that one day you will be taken to one of them because advertisements displayed by this search tool all redirect to other pages. How did Flipora.com enter my computer? The appearance of Flipora.com on all your browsers can mean only one thing – the browser hijacker has successfully entered your computer. There are several different ways these infections are distributed, but malware experts are sure that one of them is used more commonly. It is called bundling. Browser hijackers travel in packages called bundles together with applications developed by third parties, so they often manage to enter computers unnoticed. You must delete Flipora.com from all your browsers no matter this search tool has been set on your browsers willingly, or it has illegally entered your PC. How do I remove Flipora.com? You must implement the Flipora.com removal as soon as possible so that you could avoid a bunch of problems. There are two ways to get rid of it. First, you can go to delete Flipora.com manually. Second, you can erase it with the help of an automated malware remover. The second removal method is, for sure, an easier one.